Do you like to look at Christmas lights? Here are some of the best Mesa Christmas displays with a map at the bottom of the page. 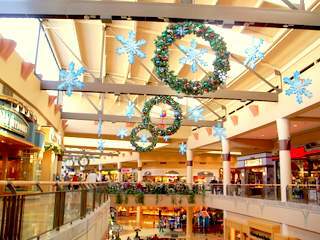 There are the obvious places like malls, but did you know there is an outdoor mall that has snow fall on the half hour? How about a walk through a neighborhood that gets bus loads of people? 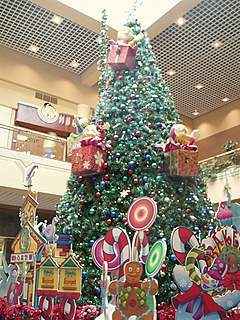 Do you have a favorite place to view a Christmas display? You can share your story and photo below. For example, I remember walking around a house where there were model trains going from the front of the house to the backyard! Let other readers know what you discover! There are malls which always have nice decorations. The Superstition Mall in the east of Mesa and the Fiesta Mall (now closed) in the west are the main Mesa malls. Malls are always great places to take kids for that Santa picture too. Can you imagine the fun of walking around in light falling (fake) snow? We visited the San Tan Village one year in December. Go to the center of the mall and find Santa's Lane. The kids will love it. Here's a video from Christmas 2010. They may not have snow every year. But there is always something going on. How about some light displays meant for walking? If you want to check out a must-see Mesa Christmas display go to the Mesa Mormon Temple. Find a place to park, if you are lucky, and wander through the grounds which are open to the public. The lights are tastefully applied to the grounds and if you get there at the right time you might be able to catch a concert. There’s a street in Mesa called W Natal Circle which is just so over the top you have to check it out. It can be packed with people on weekends. It is so popular that you might see a tour bus from Sun City dropping off a bus load of people! Park your car and take your time walking up and down the street. The amazing thing about this neighborhood is that all the neighbors do such a spectacular job. Each house has a different theme-airplanes, motorcycles, etc. There’s even a house at the end with a backyard Nativity scene that you can wander through. Now that's a real Mesa Christmas! Oh, and check out the garages when you walk by. Talk about garage envy-this place will amaze you. You can see garages of your dreams. You will see spotless, junk free, floor painted, tiki-bar equipped, beer neon light adorned, and just plain cool garages. Finally, do you want a fun suggestion to take a healthy walk and enjoy more Christmas lights? Take a drive over to the Phoenix Zoo and see the ZOO LIGHTS display there. Zoolights is next to the Desert Botanical Garden where they host the holiday show called Las Noches de las Luminarias. You can see lots of glowing luminarias and enjoy the music. Check out the page at Luminarias! 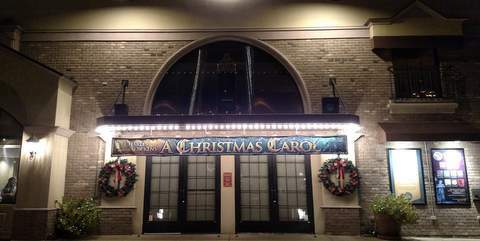 One of our favorites is the production of A Christmas Carol by Charles Dickens at the Hale Theater in Gilbert. Tickets sell out early. 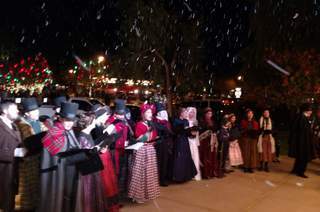 When the play is over enjoy some Christmas carols and "snow." Enjoy the lights in old downtown. Might even catch a ride on a horse carriage, right across from the Hale Theater from last year. Do you have a favorite Christmas Display? Do you have a great story about your display? Share it!